On February 27th, 2016, the APU Malay Cultural Society (AMCS) participated in the Pautan Kasih Program, which took place at Kampung Sg Merali, Batu 4, Jalan Gombak, Kuala Lumpur. A total of 100 participants from APU, 76 villagers and 26 committee members of AMCS were involved in this program. The aim of this program was to introduce Malaysian culture to the international students and also to care about the community particularly in the rural area. In addition, the program allowed the students to take a break from their studies while doing something meaningful for the community. 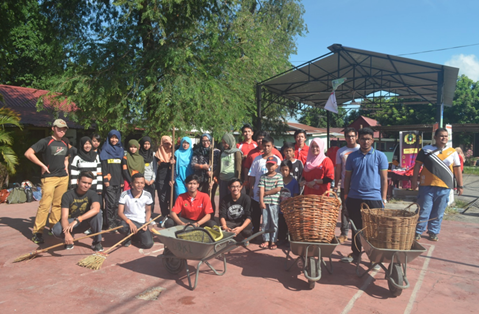 The JKK of Kampung Sg Merali, YB Dato Abdul Razak Muhammad officiated the event. Various activities were conducted to suit the purpose and objectives of this program, such as community work (gotong-royong), aerobic exercise, balloon splash, finding candy in the flour, human bridge, candy guessing and tug of war (tarik tali). Students and the members of the public enjoyed the session together. All these activities were conducted at the playground in Kampung Sg. Merali under the supervision and guidance of AMCS committee members. The event demonstrated a high level of interaction between students and public, and it was held with success under the teamwork and coordination by AMCS. We look forward to see more activities like these in the future, in which our students and staff may bring more joy and happiness to the communities in need.